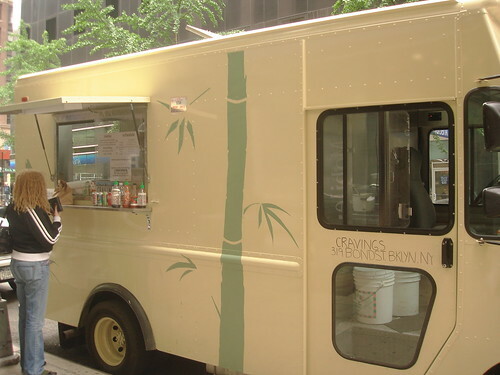 It’s been just over a month since the NYC Cravings Truck made their Midtown debut, and while not all lunchers have been as gaga about the Taiwanese truck food as I, the crowds are still turning out Mondays (on 46th btw. 6+7th) and Fridays (on 53rd btw. Park+Lex.) I’m a huge fan of their Taiwanese fried chicken w/ pork sauce covered rice, but since I originally wrote about it they’ve added tea eggs, pork chops, and tianbula (fish cake) to their menu. As soon as the Cravings truck hit the streets with their Taiwanese fried chicken, the drumbeat began for pork chops. 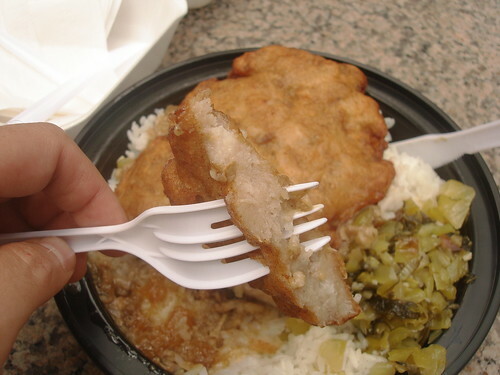 Fried pork chops over rice with pork sauce and pickles cabbage is a standard Chinese dish, popularized here in NYC by Chinatown spots like Excellent Pork Chop House and Hua Ji (both covered by our Downtown Lunch reporter Daniel Krieger.) Cravings version tasted great to me, and had a similar flavor as the fried chicken. For some, they may not be worth the extra $1 (they’re $7 compared to $6 for the fried chicken), but if you’re in the mood for pork chops, these are probably the best you are going to find in Midtown for this kind of money. Not everybody loves them though, but any complaints I’ve heard usually contained the phrase “I can get a better, cheaper version in Chinatown.” Sadly though, we don’t work in Chinatown. For Midtown, this is as good as it gets! 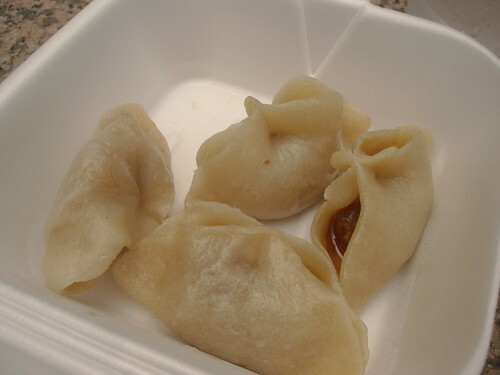 The first time I visited the truck, they had their vegan dumplings (just meh) but were out of their pork dumplings. This time I tried the pork dumplings, which at 4 for $3 hover somewhere between being not as shockingly expensive as the Rickshaw Dumpling Truck, but not as shockingly cheap as what you get in Chinatown. The dumplings don’t stand up to well to being served off a truck (the wrapper doesn’t really stay together) but I really liked the flavor. They had this sweet and savory thing going on that made them not need any dipping sauce. There will be haters (i.e. “I can get 15 better dumplings in Chinatown for that price!”), but I was kind of a fan. The one thing I like about the NYC Cravings Truck is that it’s a work in progress, but the fundamentals for success are all there. When they first opened there were complaints that they only served the thigh/leg. Now they’re experimenting with different cuts of chicken. Who knows what the “standard” serving of pork chops is, and they’ve notoriously undercooked large batches of rice on multiple locations. Sometimes the pork sauce and sour cabbage is a bit too salty, and yes, I’m sure you can get better versions of everything they sell in Chinatown for a few dollars cheaper. But you know what? We’re not in Chinatown. And overall, the food they’re serving is stand alone delicious. It might not be the Taiwanese home cooking you grew up with, but it’s all Midtown has got! 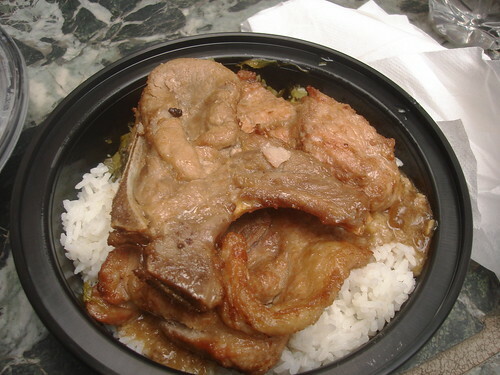 It’s the only place in Midtown to get Taiwanese style pork chops over pork sauce and rice with sour cabbage! Despite the price tag, the pork dumplings are pretty tasty, and don’t need any sauce. 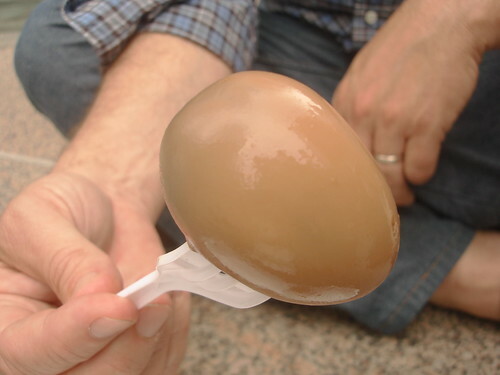 $1 for a single tea egg? Are you on crack? NYC Cravings Truck, Usually on 46th btw. 6+7th on Mondays, and 52nd btw. Park+Lex on Fridays. Check Twitter to be sure. Posted by Zach Brooks at 11:55 am, June 18th, 2009 under NYC Cravings. I don’t know. Pork chops look decent in the pic. Tianbula is Taiwanese Tempura. Their best deal still looks to be the fried chicken! Zach, who is that in the egg pic?? Did some barefoot hippie show you his huevo? Thanks for the pic of the tianbula. There are a few styles to make Taiwanese style fried fish cake (it’s technically not tempura–it’s fried fish cakes, but w/e people understand) so when they started offering it I wasn’t sure what it was exactly. The night market/street vendor variety of Taiwanese fried fish cakes can be had in Chinatown. Anyone knows if this is similar to that at all, or is this just a floppy fried thing? I absolutely love this place, but I can’t reasonably wait on that line. At 11:45am on Monday, it was a mad-house. The line was all the way to sixth ave. Its worth it once in a while, but that’s just crazy. I guess tianbula is sort of like tempura… it’s sort of not. Usually when people say tempura, you get this image of a light, flaky crust that surrounds shrimp or various vegetables. I have never in my life ever had tianbula where the outside was distinctly crunchy. They fry ‘em, yes. But it’s not like a tempura that people know. the sour cabbage is supposed to be on the salty side. and yes, the fried chicken i think is still their best offering. have had it almost every monday and friday since they’ve started! 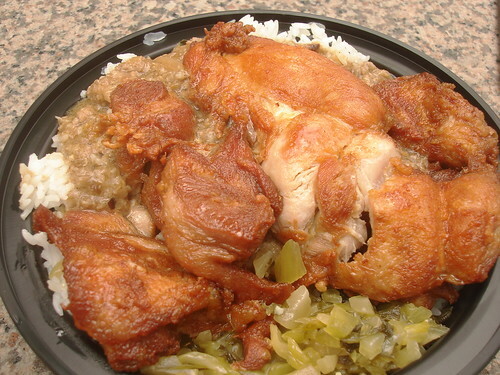 I thought about doing a Chinatown run every Monday and sell the tastier chicken over rice below the truck price. In northern Taiwan, tempura is also known as å¤©å©¦ç¾… or ç”œä¸è¾£ (tianbula) and can be found at night markets such as Shilin Night Market and Keelung Temple Night Market, where it is famous. The ingredients and method used for making Taiwanese tempura are completely different from Japanese tempura, and they share only the name. The rice (undercooked last time) was fixed this time around. The tea egg with a rice platter really adds to the dish. Even though the value of a 1 dollar hard boiled egg seems tough to stomach, I would recommend it just to add a different layer of texture to it. Its mildness also works well with the strong pork sauce and pickled veggie flavors. I liked the pork chop flavor better than the chicken, but the chicken is a dollar cheaper and also juicier. It’s a toss up for me. Thanks for chiming in Chris. I suspected it to be the case from the picture, although I’m not sure what you mean by ridiculous (besides the price). I tried to get the fried chicken today but they sold out. Damn the busy friday. Oh well.